With unicast, the metric is used to determine a low-power path between sources and destinations. The source and destination entities could be attached to Autonomous Systems (ASes) or to routing areas within the Autonomous System. Determining a low-power path within an Autonomous System provides a unique challenge as the topology of the constituent areas may not be known. To that end, we propose the use of a selective leak technique for disclosing low-power paths. Additionally, the proposed method can also be used to determine disjoint or redundant paths for load-balancing or fault tolerance. With multicast, the metric serves the twin purpose of finding low-power multicast paths as well as multicast replication points. Once low-power paths in either the unicast or the multicast cases are identified, then currently available traffic engineering techniques could be used to route the data packets. IP traffic, in the near future, is expected to increase significantly (Dhamdhere, 2011). 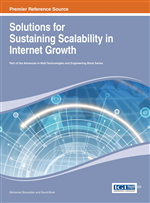 To handle the increased volume in traffic, it is natural to expect that devices with higher capabilities as well as capacities have to be used in the Internet. It has been recently suggested that to cater for the anticipated increase in traffic, the Internet would need four times the current number of devices (CiscoPress, 2012). Increase in the number of devices readily translates into higher energy consumption for the Internet which, as of 2007, was one percent of the total generated power (Baliga, 2007). Therefore, it becomes imperative to provide solutions that help to reduce power consumption. Switch-off the links that are currently not being used. However, this simple method does not explicitly consider the impact of increased utilization on neighboring routers, the power consumption associated with switching links on and off, and finally the impact of configuration changes on the line-cards. Use traffic engineering techniques such as Resource Reservation Protocol – Traffic Engineering (RSVP, 2001; 2008) to route the data through a low-power path. The discovered topology is represented as a connected graph. When considering the interconnection discovery between Autonomous Systems (AS) (defined as inter-AS) we use the Border Gateway Protocol (BGP) (Rekhter & Li, 1995) strand information to discover the topology. For topology discovery within Autonomous Systems, i.e., the intra-AS approach, we propose the selective leak technique whereby the identified low-power paths within a routing area are transferred to other routing areas a-priori by the Area Border Router (ABR). In the graph topology that is discovered, for unicast the metric used is consumed-power to available-bandwidth and for multicast the metric is consumed-power to available-replication-capacity. The metric determines the cost of the link in the topology and we apply the Constrained Shortest Path First (CSPF) algorithm to establish a low-power path between the source-destination pairs. To implement the proposed scheme, we rely on some additional information to be carried by the routing protocols such as Multi-Protocol Label Switching (MPLS) (see Viswanathan, 1998) for its evolution), Border Gateway Protocol (BGP) and Interior Gateway Protocols (IGP) such as Intermediate System to Intermediate System (IS-IS) (Callon, 1990) and Open Shortest Path First (OSPF) (Moy, 1997). Once low-power paths are identified, we apply the Inter-AS TE Label Switched Path based Traffic Engineering (TE) techniques (Le Roux, 2005) to establish a path to forward the data packets. The path is formed by an ordered set of neighboring network elements (typically AS in inter-AS scenario, areas in an intra-AS scenario and routers within an area). In this chapter, we show the applicability of our technique to MPLS-based networks.